Not sure whether to high-five bees or run away from them? Well, maybe you shouldn't high-five them, but you definitely don't have to run away from them. In this enthusiastic, hands-on approach to bees, the book's narrator will convince the pizza-loving bee skeptic - and you - of just how cool bees really are. Did you know that 98 percent of bees are girls? Or that they have two stomachs (which would come in handy for more pizza eating)? 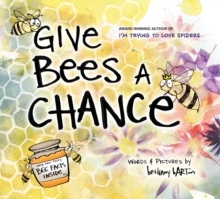 Bethany Barton's hilarious text and kid-friendly illustrations will have you singing the praises of our buzzing neighbours - or at least will convince you to give bees a chance.